This book is focusing on a Late Pleistocene Weichselian Glacial cave bear den in north-central Europe. Such cave bear dens are larger cave systems, mostly filled up with ten thousands up to a half Million of cave bear bones. 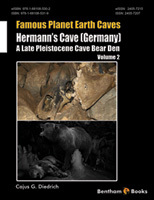 However, this book does not survey only the bones of the Hermann’s Cave in the Harz Mountains, Saxony-Anhalt (northern Germany), but also highlights the paleoecological change of the den during 113.000 years located in the Bode River valley close to former valley glaciers present in the Last Ice Age. Interdisciplinary geological, paleontological and archaeological studies make the cave important for our knowledge on the local geomorphological development of the Harz Mountains during the last three Ice Ages (Elsterian, Saalian and Weichselian) reflecting the impact of the most northern mountain valley glaciers in Germany. Recent research during the past 10 years has changed dramatically our view on “the cave bear”. New molecular data and osteometric evidence from skulls and teeth (= “cave bear clock”) suggest that speciation processes resulted into the separation of several species and subspecies within the Late Pleistocene – the past 113.000 years. The behavior and ecological role of European cave bear taxa was consequently misunderstood for a long time and the antagonistic interactions with the other extinct top predators - steppe lions, Ice Age leopards, Ice Age spotted hyenas, and Ice Age wolves – have not been fully considered. The predation and scavenging of carcasses representing a smaller and a larger cave bear species/subspecies are explained in this book as spectacular examples of the interaction with steppe lion whose skeletons (at least three) were discovered deeper in the Hermann’s Cave. This extraordinary book on Hermann’s Cave provides clear evidence for its international paleoecological importance. It deepens our knowledge and understanding of life and extinction of cave bear taxa which appears as a series of events beginning with changing climate leading to the expansion of boreal forests and the reduction of food resources during in the Last Glacial Maximum, and followed by the predatory impact of large carnivores and Cromagnon humans. In the deeper part of the cave Aurignacien hunters left with their tools the oldest cave bear hunt proves most probably with propulsion weapon technique during the bears´ winterly inactivity period. The new Famous Planet Earth Caves e-book series challenges to present important caves all over the world scientifically, but somehow also popular in a mixture, that non-experts can understand their main importance. The Hermann‘s Cave in northern Germany is one of the largest show caves in Germany and Europe and has an important Ice Age related history starting only about 350.000 years ago with most importance for the Late Pleistocene (MIS 5d-2) and its impact for the landscape and LGM glacier reconstructions of the Harz Mountain Range. This is a beautiful granite (Brocken Peak) and limestone (cave areas) rock and valley cutted landscape, that became famous already in historic times. It was visited by many famous natural scientist pioneers starting already at the end of the 17th century. The book is interdisciplinary but with a strong focus on its main international importance – the Late Pleistocene fauna and archaeololgy. The cave system was used by different cave bear types as cave bear den within a former boreal forest environment of the medium high up to 1.014 a.s.l. elevated most northern German mountain range. It presents a review of scientific work of the Brunswick Palaeontologist/Archaeologicst pioneer Prof. Dr. W. Blasius after more than 200 years. It is a catalogue compendium and adds knowledge to small and large cave bear species/subspecies ecology in Europe including interactions with steppe lions and Cromagnon humans, and their life and battle to survive in taiga forest mountain areas of central Europe. In Europe it is the second very important cave, that has delivered some steppe lion skeletons deeper in the cave between cave bear skeletons – a rare proof for their cave bear predation. From the archaeological point of view, the cave has another unique and convincing European cave bear hunting prove by Late Palaeolithics deeper in the cave using propulsion weapons. The project also demonstrates the large “cave society problem” and the conflicts between scientists, private caver clubs and cave owners. Spleunkers have other interests as bat protectors, palaeontologists, archaeologists or cave owners, whereas the bones which are the most important in the cave – are treated worst: being trampled, skeletons are damaged in context by taking trophies or during electric cable installations, etc. The best/worst example for the long-tradition of quite bad cave treatment is the original cave bear skeleton composite made historically by Kloos, which was replaced “dumped” in the Bear Hall between other bones by a “plastic cave bear skeleton”. The “palaeontological Picasso” was of less worth, at a cost of 5.000 Euro most expensive replica, and it was worth less as the 2015 expensively restaurated “concrete bear” in the centre of Rübeland village – which demonstrates the still remaining difficulties in understanding the real value of the cave and its “stories”. This book should open the eyes for the really important facts of the cave and its “bone stories”, so that they might become “alive” in an Ice Age cave Safari story in a future Museum being installed sensitively within the cave. Finally, the book is dedicated to a good friend, the archaeological cave researcher and specialist for Iron Age cave use in the Sauerland Karst cave region of northern Germany, Dr. Wilhelm Bleicher, who sadly passed away beginning of 2016. This book project was supported by the new cave manager T. Schult, which is the base for a future new exhibition and “cave story”. The city Oberharz am Brocken (here especially mayor F. Damsch) and the Landkreis Harz, Untere Naturschutzbehörde (permit Nr. 96705-2012/kkr) such as former cave manager C. Hensel allowed the cave studies. Prof. Dr. U. Joger gave access to the historical material from the Baumann’s Cave which was supported by the curator Dr. R. Kosma of the Staatliches Naturhistorisches Museum Braunschweig. Access to the collection of the Museum für Naturkunde Berlin of Humboldt University with the Hermann Cave material (Steiner 1961/Völker 1984/85 excavations) was possible thanks to PD Dr. O. Hampe and Mrs. S. Scheffel. A bone cleaning of about 2.500 bones and cave expedition was assisted by N./E. Schuhose, G. Vollmer and B. Baumbach of the Arbeitsgemeinschaft für Karstkunde Harz e.V. Dr. R. Mischka (Landesamt für Denkmalpflege und Archäologie Sachsen-Anhalt) supported the study of the archaeological and palaeontological finds which are housed in the LDA. Dr. B. Stoll-Tucker supported with a photo of the Late Palaeolithic bone point. Finally I thank Prof. Dr. B. Rothschild review support of one chapter. A good friend, the biologist T. Parker from the US, made a great spell-check of the first version. There is a competing interest with the show cave owners (city Oberharz), which will need to use the content of the book for commercially show cave guided tours and exhibitions. All contents or illustrations stay in their commercial copyrights by the author and have to be requested for use permit.